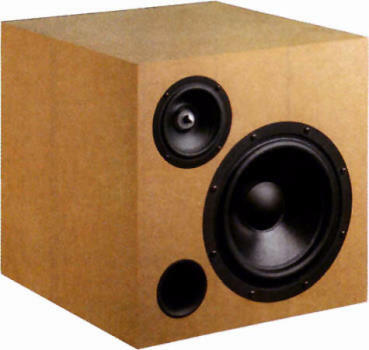 Cube 8BB4 stands for 8 inch woofer and 4 inch fullrange driver (the German word for fullrange is BreitBand, therefor BB). Both are in a cubic cabinet: a 2 way bassreflex loudspeaker with Omnes Audio fullrange BB 4.01 and woofer Omnes Audio Exclusive 8. Cube 8BB4 has been developed by Blue Planet Acoustic. The crossover consists of a 3rd order high-pass filter (18 dB per octave slope) for the fullrange speaker and a 2nd order low-pass filter for the woofer. A RLC resonant circuit in series to the fullrange loudspeaker eliminates unwanted resonances. The frequency response of this speaker is linear (except for higher frequencies, like it is typical for fullrange loudspeakers). The decay spectrum is nearly perfect. At low volume, i.e. 85 dB at 1 m, the nonlinear distortions are lower than 0.2% between 500 and 10 000 Hz and rises not over 0.5% at 95 dB at 1 m .